We had a great holiday! We were put in a room on the 5th floor and wow! What an amazing view we had of the pool and the sea! The beach is just a 5 minute walk away from the hotel via a short pathway or you can go through the sister hotel called the abou sofiane! The staff cannot do enough for you they all bend over backwards for you! They all have a smile on their faces! The animation team at this hotel are all great! The food is great and there is always something to eat! The hotel is very clean there are always maids around cleaning up! Also the swimming pool and the water slides are VERY CLEAN! They are cleaned every day!!! All in all we had a great holiday and we cannot wait to go back! The Riviera isn’t the poshest hotel but must be the friendliest with the most amazing staff. The rooms are lovely and most overlook the pool and gardens. The restaurant is spacious and the food nice especially the Tunisian specialities. Desserts are to die for! The hotel is set back from the beach down a path and has a beach bar which wasn’t open when we were there. The sand is soft and white and the sea shallow. The animation team have only been together for a short time and are not as good as other ones we have seen in other hotels. We just sat in the lounge chatting to new friends. It’s a 20minute walk from the Marina past golf courses. I wouldn’t hesitate to return especially during our winter months. This was a cheap holiday but the hotel was just fine. We cannot fault it. The food was lovely, plenty of choice and no upset tummies. The service was really good if you tipped every few days which we didn't mind doing. The beach was lovely, and had its own restaurant down there but you could not get any alcohol there. We tipped the beach attendant every few days and got great sunbeds in prime location waiting for us. We did not use the pool but it looked fine, with a separate pool with a couple of slides in. The room was clean and had a fridge, tv, only 1 or 2 English speaking channels, hair dryer etc. The gym was a waste of time, if you want a decent gym stay at the Abou Soffiene next door. One tip is get a room on the top floor as you can hear everything above you. You get what you pay for, if you want luxury then you need to pay a lot more. 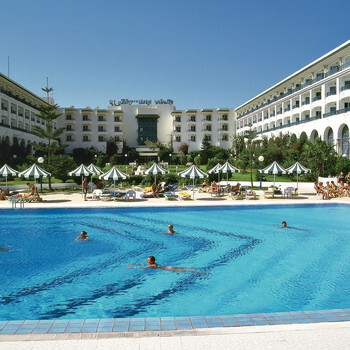 I stayed i nthe riviera hotel in april it was fantastic it was my first time abroad and i absolutely loved it. All the staff were lovely i am deffenelty going back just to see kamel wannace and habib i absolutely loved spending time in the cocktail bar and in the little cafe with habib where you can always go for a laugh. Just arrived back after two weeks, this hotel and it's sister hotel Abu Sofien was absolutely fabulous. Food was very good to say they had to cater for so many different nationals, you would have to be very fussy to go hungry. Good size swimming pool and great beach. I would say if your taking young children the sister hotel would be better has there's more going off. The animation team did a great job and the shows at night were very professional. About Port el Kantaoui very nice harbour and small shopping area, most locals very nice but a few did try and rip you off especially over drinks be sure to state small or they will fetch large and charge more than double. also be careful with teenage daughters. There are a few trips etc but only last a couple of hours so don't pay for boats trips and expect a full day out. Water sports are very reasonable and are very safety conscious. If I had a complaint it would be June/July is too hot and all the tipping even in hotels where you've already paid. This hotel is in a very good location to everything around it. Turn right for a 20 min stroll to the port or a 5 min taxi ride which will cost you 3 diners (£1.50) or turn left for a five min walk to a supermarket. Also when turning right you will find a lovely golf course 10 mins away. The hotel staff are really friendly and will go out of there way to accommodate you and help you out! The Animation team are brilliant they kept us entertained with different activities during the day which made the days pass quicker when we had bad weather. The same guys then done the evening entertainment which wasn't great but was watchable so I am giving all credit to them! The Hotel's public areas were always very clean and tidy, your rooms were also cleaned everyday and new towels supplied. The maids are also very polite and will leave your room until later if you are still getting ready etc. The food was alright, not a great choice but I think this was more to do with the time of year which we traveled. The snack bar is great for lunch time as the food is freshly cooked for you. You can have one visit to the Italian restaurant and Tunisian Restaurant which I would recommend as it is something different, although I would agree with other comments that the Tunisian is much better. You can also you the facilities in the sister hotel. The Disco is really good for a late drink and music isn't that bad either. Advertised by Thomas Cook as Occidental Riviera. Quite a good location as only a 20 minute stroll to the harbour and no hassle from over eager locals on the way. Harbour has some nice little shops, again with very little hassle from the shop keepers. As we were all inclusive we didn't eat or drink at any of the harbour restaurants but some did look quite tempting. Rooms and public areas of the hotel are kept very clean. Bedroom and bathroom functional but basic, shame that the t.v. only had an english speaking news channel available until lunchtime. Meals were o.k. and you didn't starve but they were never very hot. Breakfast was about the best meal of the day with fresh pancakes and omelettes. Staff were very good at remembering your favourite tipple and having it ready quickly. We ate in the Tunisian and the Italian restaurant and found the Tunisian far better. The food was served hot and the quality very good. The Italian restaurant had very poor service and the quality of the food wasn't very good. Evening entertainment was awful and a fight nearly broke out one night when they played bingo for money and then discovered there were no 80 - 89 balls in the machine ! Had a full body & face massage in the health spa for only 20 dinar and it was wonderful. Weather for the end of February wasn't too bad I suppose, 2 days of sun, 1 day of rain and the rest fair. Thomas Cook rep "Steph" was one of the friendliest, efficiant reps I have ever met. The Thomas Cook evening out at Sousse "night of a thousand stars" was excellent. This was our first visit to Tunisia but I don't think I'd be keen to rush back. Excellent value as we paid very little for the two week Xmas and new year break. The price included the gala dinners on Xmas and new years eve which were superb. The hotel was fabulous. The room was spacious and cleaned daily. Our only complaint is that the cleaning staff had a tendency to disregard do not disturb card on the door and would just walk in! The food was acceptable, one has to remember that they cater for many tastes and as such the meals won't please everyone all of the time. My husband and I always found something to eat whatever time of day or night we wanted something. We didn't try the Tunisian restaurant but took advantage of two visits to the Italian and boy was it good! The staff were all so friendly and nothing was ever too much trouble for them. We walked into the lobby bar and our drinks were poured and waiting for us after just 24 hours (no we aren't alcoholics honest!) The cocktail bar man made us specials every night and gladly came up with stomach settling remedies when I had a bout of indigestion! Entertainment was at times basic and somewhat Butlins style but still good. The guys work long hours and try so hard to keep everyone entertained and Xmas day saw us taking part in a donkey derby on real donkeys. We felt that everyone made a real effort to ensure we were happy and would not hesitate to go back to this hotel again. Stayed at the Occidental Riviera hotel last week in October. After what seemed to us a very short flight with FCA we arrived at Monastir and spent almost an equal amount of time waiting for our luggage!! We had not visited PEK before and after a week in Hammamet several years ago I was quite nervous as to what it would be like. I need not have worried. Out of the 2 sister hotels it seemed we had chosen the superior one. First impressions were good and my only beef would be that our room (although it was nice) was on the side facing an adjacent hotel and it was also obvious that the balcony would get no sun at any time during the day. I was promised a swap for the next morning but this didn't actually materialise until day 3 and by this time my husband said they could 'stick it'. They sent a bottle of wine up to our room as an apology and this may still be there as we didn't touch it, have to be fair though and say that overall the hotel and the room was good. The food was OK and there seemed plenty of choice especially the puddings!! The grounds were nicely laid out and a short walk took you through the sister hotel to the beach. Although we didn't go in it the pool looked very inviting but I did notice that claims to the sunbeds were made very early in the morning. It was probably because it was half term but there seemed to be lots of kids staying here (even more at the sister hotel) and the worst ones by far were the French who let the little darlings jump all over the furniture in the A/I bar at 11.30pm one evening. There were 2 speciality restaurants on site Tunisian and Italian which you could book once each per week. Didn't get round to the Tunisian but thoroughly enjoyed the Italian. Animators all seemed to work quite hard with different things going on during the day and evening. Majority of staff were very pleasant and helpful, rooms always clean and in good order. My advice about the A/I drink is buy a bottle or two on the plane as you're going to need it. My vodka (even with another measure in it) tasted like the teeniest bit of lemonade I had added to it. Nicely situated for a walk into PEK either via the beach or main road. Couple of shops up the road to the right of the hotel including quite a large sized leather shop. We enjoyed our short stay in PEK at the Riviera and would probably return. The rooms are beginning to look their age, curtains and bedspreads as Steve Frost remarked, are very shabby and stained and definately due for replacement. The whole Hotel is in need of refurbishing and during our 14 day stay, we were down to 1 lift on some days, there are only 2 plus a service lift anyway. Staff are very helpful if all of them a little tired especially as the hotel was over run and overbooked with Russians who have no manners and no idea of how to behave. British Tourists who had booked for the Allegro were being asked on arrival if they would consider moving to other accommodation so the Russianm guests(150) could stay together. The Pool area is very clean and nice clear water, only problem was the Animation Teams and the constant booming music and requests to join in "Games", most of the guests picked the Allegro for a restful holiday, if you wish for a boistrous holiday you book at the sister hotel behind the allegro called the Abou Sofiane. Also more alarmingly, there seemed to be a flux of clothing and items being removed from rooms, warning..."DO NOT LEAVE MOBILE PHONES IN YOU ROOM LYING AROUND THEY WILL WALK" management did not seem at all perturbed when these matters were reported. The Hotel is looking its age and seems to be rather Tired, Food was boring, cold and repetitve and also stomach upsets were rife. Very dissapointed at the way this hotel has declined in the last 6 months, in fact we have cancelled our May 2006 booking and will be looking elsewhere. What a shame, we have earned red bands which now mean absolutely nothing, these are earned after 5 visits, but are now being issued willy nilly to keep face with angry guests.